Jillian has had dogs her entire life. Early on, her family’s first two dachshunds were both purchased from breeders. However, after those, all of their dogs (and there have been a lot), have been rescues. Knowing what she knows now, Jillian’s family likely wouldn’t have waited until dog number three to start rescuing from adoption organizations, but she believes that back then there was not as much information and awareness available. 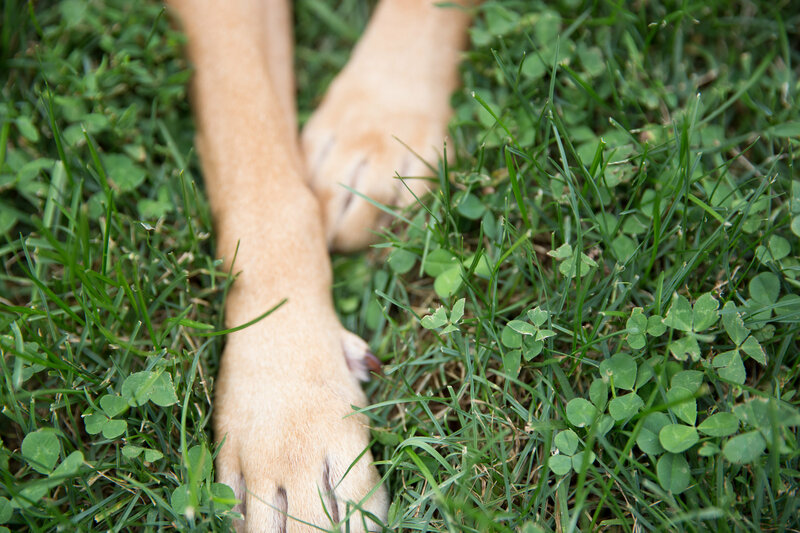 In addition to rescuing dogs from shelters and adoption organizations, her family also came across stray dogs in and around their home town in Kansas. They would help reunite these dogs with their owners, and/or work to help find them a new home. Jillian champions adopting vs. buying and encourages anyone thinking of getting a dog to do the same. She feels that many people who purchase dogs from breeders are unaware of the fact that they may be supporting animal cruelty because of the high prevalence of puppy mills. Jillian moved to New York City over three years ago. Shortly after, she was walking through Union Square and she caught sight of a scruffy looking shepherd mix named Riley. She walked over and started talking with one of the Mighty Mutts volunteers and learned about Riley’s sad backstory. That’s all Jillian needed to hear to know that she had to get involved and she signed up to volunteer. It didn’t take long after that for her to take in her first foster. 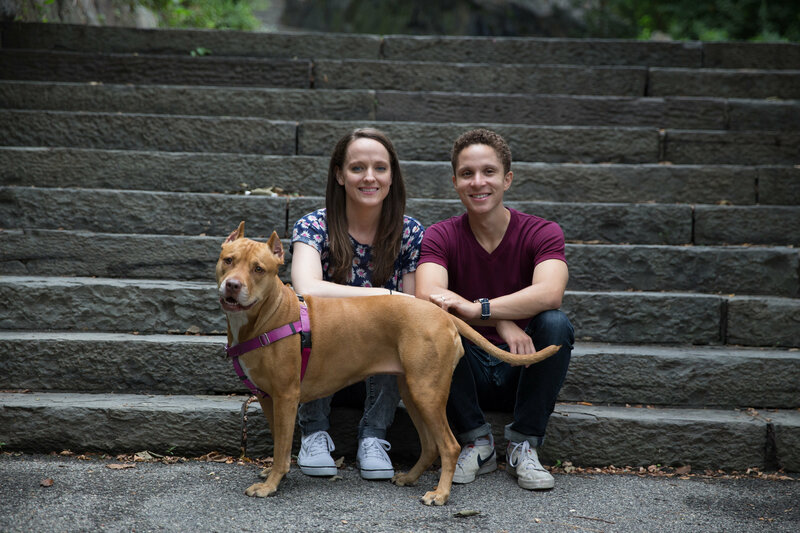 When Jillian’s first foster dog was adopted, she and her husband, Alex, were engaged and in the midst of wedding planning. They made the difficult decision that they would not take in any more fosters until after the wedding. However, not long after they made this promise to themselves, Fern came in to Mighty Mutts. It was clear that Fern had been subjected to deplorable, inhumane living conditions. She was a junkyard dog on a property just outside of Philadelphia. Her owners had cropped her ears incredibly short, she was permanently chained outside, and there was an unofficial history of abuse. Concerned citizens tried to remove Fern from this situation, but for legal reasons they were unable. It took a call to the Animal Care & Control department in Philadelphia reporting that she was running loose – their way of finding a legal solution to saving this poor dog. But, their plan had an unforeseen hole in it. Fern was taken to Animal Control and was scheduled to be euthanized. Mighty Mutts stepped in before this could happen. Fern was put into a foster home near Philadelphia with an amazing woman named Annette, who has helped many dogs have a second chance at life. 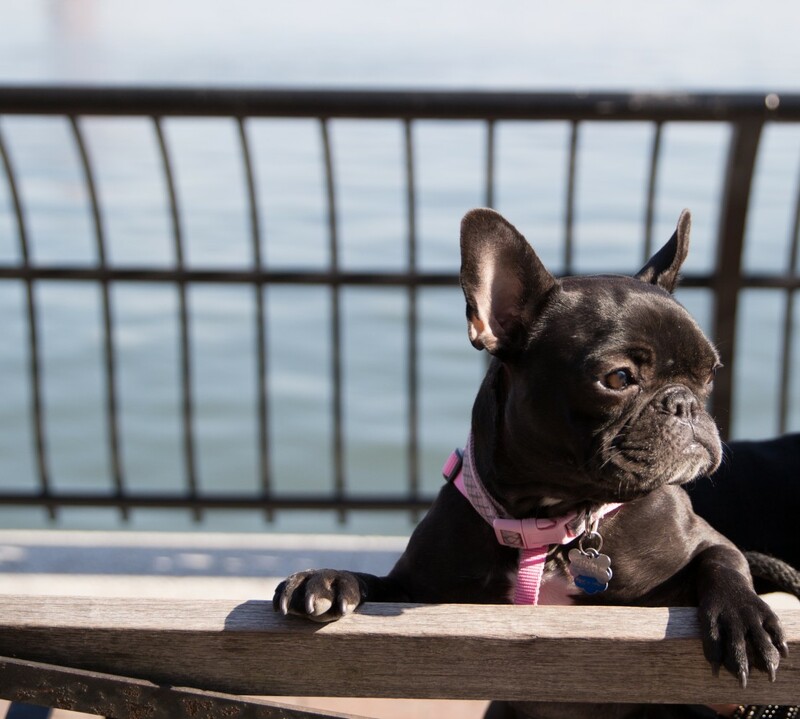 At the time, Annette had several other dogs, and to get Fern up to New York City for the weekly adoption drives in Union Square proved to be difficult. Mighty Mutts knew that they needed to find someone local to foster Fern and help continue to rehabilitate her to fit back in with society. Although Jillian and Alex were not looking to take in another foster, one of the adoption coordinators for Mighty Mutts had a different plan in mind. Jillian said that during her next volunteer shift, she was “set up” by being asked to look after Fern for the day. (For the record, both she and Alex do not hold any grudges against said coordinator!) Jillian said that “after one volunteer shift, I was hooked. It took one or two weeks before I wore Alex down.” It wasn’t long after they started fostering Fern that they realized they would never be able to let her go, and they officially adopted her. In the short time Fern was living with Annette, she did a great job starting the rehabilitation process. When Jillian and Alex took Fern in, they recall that, “Fern was a dream. She never had an accident, was a quick learner, and was eager to please.” However, being that she was a junkyard dog with no formal training and being subjected to abuse for 2.5 years, it meant that there were still some personality and behavioral issues that needed to be addressed. They said that Fern started out overly skittish and sensitive and that “the first Fourth of July, which was only a couple of weeks after we adopted Fern, was very traumatizing. Something as little as a car door shutting would cause her to panic and run toward the apartment.” Fern was also leery of strangers, especially men. Working with trainers and with hard work, patience, and dedication, Jillian and Alex have helped Fern become more confident and trusting. In fact, last October, Fern became certified as a therapy dog and now they visit a local nursing home and provide happiness and comfort to the residents. Fern brings so much joy to Jillian and Alex every day. “She is incredibly goofy, sweet, and gentle. 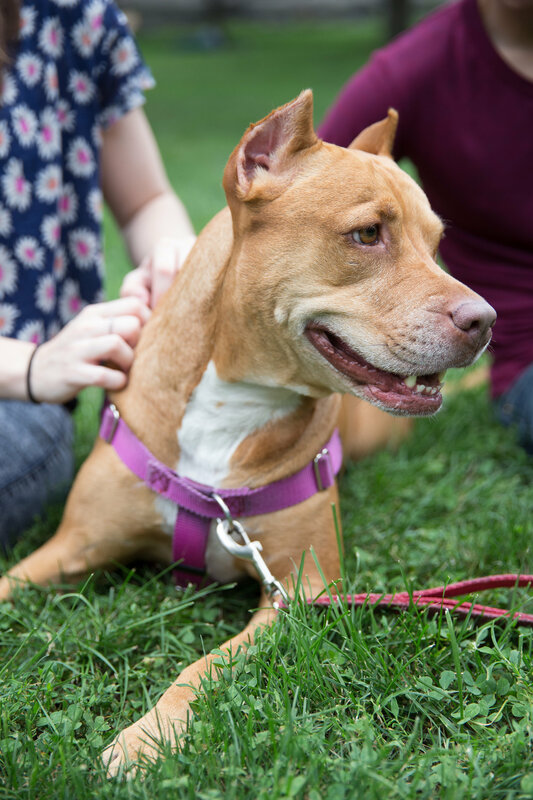 There’s something about waking up next to a tail wagging dog, oozing gratefulness that makes life so much happier.” Unfortunately, because she is a pit bull, not everyone can understand how Jillian and Alex can feel that way. 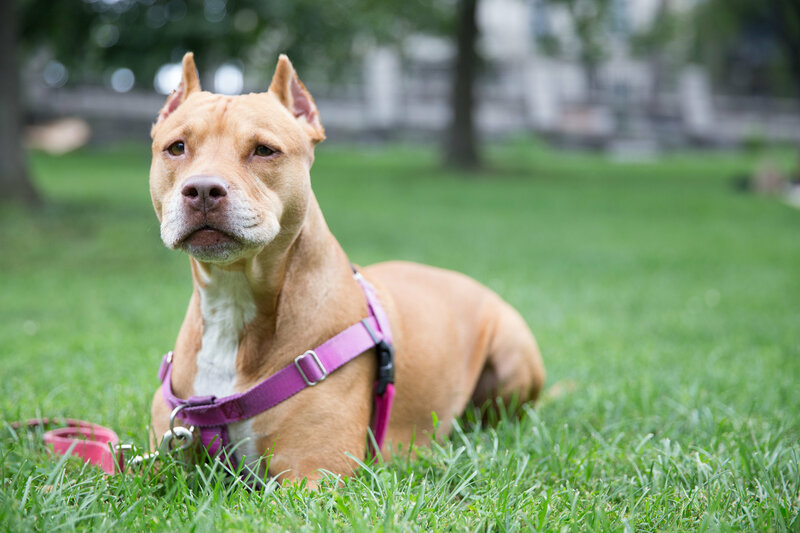 They have been exposed to people’s prejudices against the breed and even on some therapy visits people assume that she is aggressive and therefore don’t want to go near her. 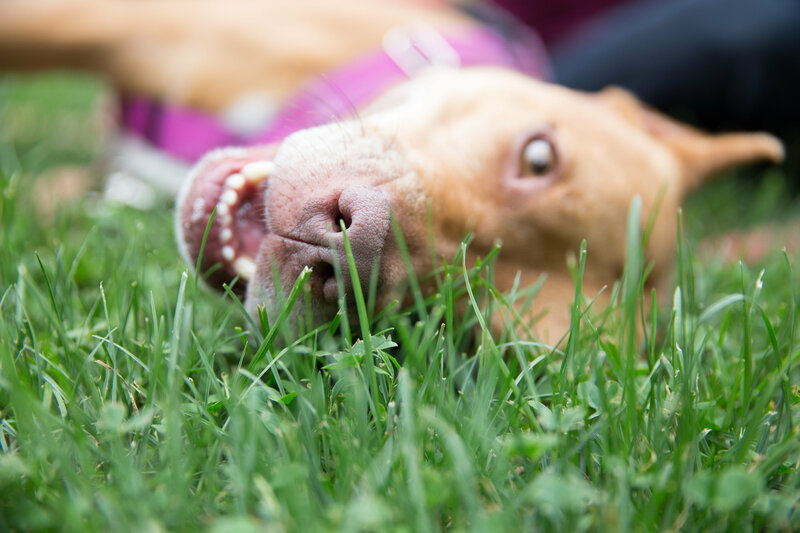 Through their rehabilitation of Fern, they make the attempt to show people that pit bulls, like any other dog, should not be judged by what they see in the media. Based on her background, Fern would have every right to be untrusting of people and aggressive. But, despite everything she has been through, she is the sweetest and most loving dog Jillian has ever had. She said that Fern “passed her temperament test with the therapy organization with flying colors. 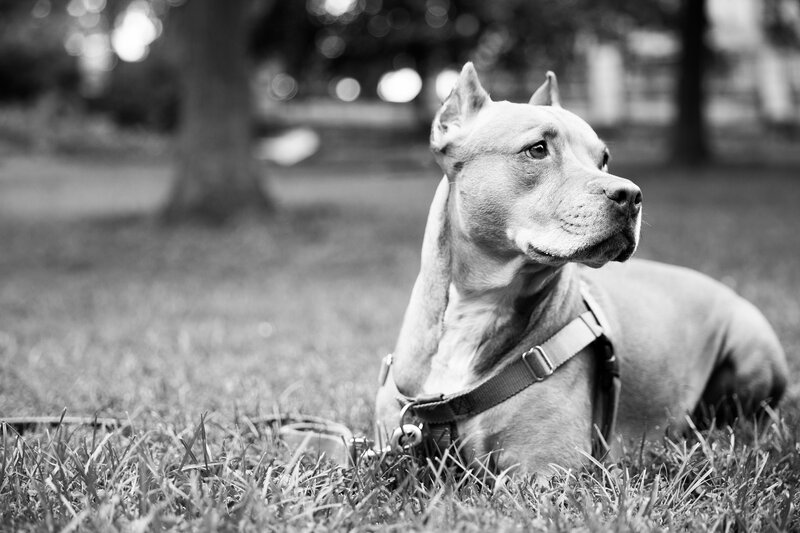 She gives kisses to strangers, and wiggles with delight when she meets another dog.” Hopefully through the various organizations representing pit bulls and through success stories like Fern’s, public opinion will begin to shift and people will recognize how loving this breed actually is. Jillian says that even though they were not looking for another dog at the time, and with the occasional comment or reaction from others, she would absolutely have done this again if given a do-over. She says that Fern has enriched her life in ways that she could not even imagine. Jill has now been with Mighty Mutts for just over three years. She’s seen the passion and dedication that this organization has for the animals under its care. She especially likes the fact that Mighty Mutts is completely no-kill and has a policy to take back an animal at any time, for any reason, no questions asked. Jillian said that “these values are important to me in aligning myself with a rescue group. There are just so many animals that need homes, and she applauds the efforts of all animal rescue groups.” One thing is certain – Mighty Mutts has stolen her heart! I just cried! I love Fern and what you two have done for her. Lucky humans/lucky dog.